Good morning friends, happy Friday! I know I normally post on TTH, but I thought I'd give the Tuesday/Friday schedule a try so my schedule isn't so packed and I have more time to create quality content! Let me know what you think schedule (or content) wise below please, I am running low on post inspiration! WHEW, long winded side story aside, I thought I'd share my current everyday makeup routine with you guys because A. this is the week of routines since I shared my workout routine on Tuesday, and B. I haven't done one of these in a while, and I wanted to share lots of new things with you guys. I should clarify, I don't wear makeup everyday. Because I work with a 3 year old and a 1 year old, they don't really seem to care whether I look all put together or just roll out of bed, so I really tend to skip it during the week. But, when I go out on the weekends, I do like to feel my most confident, so that means at least a fresh complexion and some mascara. I tend to keep things pretty natural, but if you want some really excellent makeup inspo, head over to my sister's instagram. She does all the colorful, totally-out-of-my-comfort-zone but totally gorgeous stuff. With me, if I'm wearing eye shadow it's a big day! I recently picked up this coconut smoothie moisturizing primer by First Aid Beauty and I am obsessed. First off, it smells like the beach, or a really beachy drink. It's a very light pink cream that evens out and slightly brightens your skin tone while keeping you hydrated under your makeup. I will say that after about 8 hours my skin starts to dry out, but I'd say that 8 hours is still a good bit of time and it really helps my makeup to apply smoothly and not stick to any dry patches, so I'd recommend it if you have dry or sensitive skin like I do. 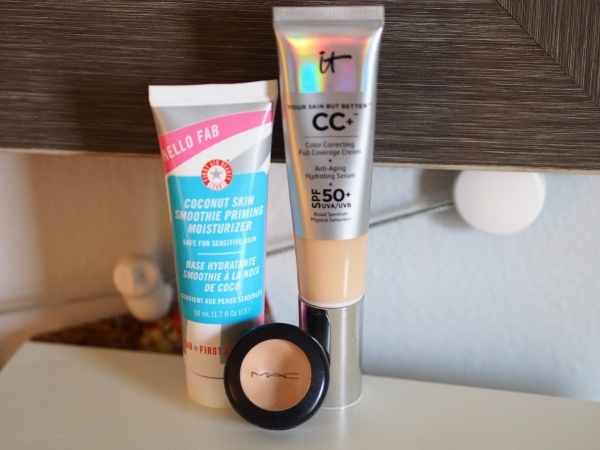 I blogged about my It Cosmetics Your Skin But Better foundation a little over a week ago, so I won't go into too much detail, but it's a winner in my book. Has SPF 50 which is huge for my pale, easily burnt skin, and it is natural without being too dewy or greasy. I usually stay away from full coverage because I don't want anything cakey, but this really does look natural, and you can make it even lighter if you apply it with a damp beauty blender. If you want to read my full review, you can here! Last but not least, my tried and true Mac Studio Finish concealer in NC15. This stuff has people totally divided, because some people think it's too slippy and doesn't stay in place, but for someone with dry skin and under eyes, it's amazing. I have it in a lighter shade than my foundation, so it's very brightening, and it just gives the prettiest natural glowiness to my skin. It has to be powdered so it stays in place, and it does crease on my eyelids, but those are the only cons for me. I don't see myself ever using anything else, that's how much I love it. I use Mac Mineralize Skin Finish in Light Plus to powder everything down and I love it. It's light, never cakey, and doesn't get darker once it's on my face. It takes away any shine my face might get during the day but still leaves my skin looking fresh and natural, never dried out or flat. 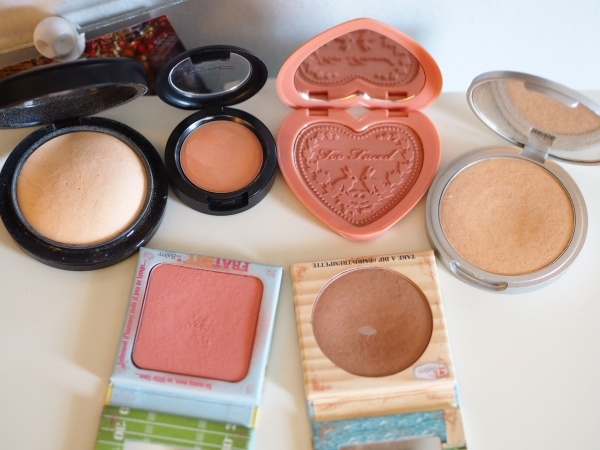 It should come as no surprise that I am still using my The Balm Desert bronzer. It's the perfect neutral shade for me - not too grey, not too red - and it gives me a very subtle sunkissed look. Because I don't tan easily, I like the added warmth to my face, but I never have to worry about it looking overdone or orange, which I love. I think this is perfect for people who are just learning about contouring and want to try it out or people like me who just want a natural, no fuss color! I am SO excited to share this new blush color with y'all because it is amazing. It's from Too Faced and it's called "Baby Love". A Youtuber I follow recommended it and I tried it in store because of how good it looked on her. I normally go for brighter blushes, but I swear, something about this brings out my natural flush color and brightens my whole face without being overpowering. It has a slight shimmer running through it so it adds a bit of a glow, but in a very natural, rosy cheek way that I love. I think it would look great on pretty much everyone because it is very natural, plus I find it lasts all day on me, which many blushes I've tried don't. Again, no surprise that I'm still using The Balm's Mary Lou-Manizer to highlight. It's light enough for my pale complexion, blends incredibly easily, and gives enough of a glow for me to feel "dressed up" without making me feel like a disco ball. I reviewed my favorite Balm products here if you want to see my other favs and read a more in depth review! All in all, love the brand because they make amazing products at really affordable prices. I have very long, but also very straight eyelashes, and I promise, it's a blessing and a curse. When I was in high school I used any mascara I picked up and never really cared, but my eyelashes would just stick straight out. Now, I curl them about 3 times and only use Maybelline Lash Sensational waterproof, because that's the only thing that can even remotely help them hold a curl. I love this one because it adds tons of volume and length without clumping and doesn't flake off on my under eyes throughout the day. It is hard to get off, as any waterproof mascara is, but to me it's so worth it. I think it's about $6, and the wand is amazing, so you can't beat that! I have a love hate relationship with my brows, but ever since I've been using these two together I have really been enjoying filling in my brows and liking the way they look. I thankfully never really over plucked in middle/high school because I had no clue what I was doing, so my eyebrows are pretty thick, they just don't have much of a shape. I use the Ardell pencil, which has a slanted, wide tip, to add a bit of an arch and fill out the edges first, and then run the Maybelline brow gel over the top to darken them a bit and lock them into place. I know it sounds crazy, but if I don't gel them down I look a little like the Grinch at the end of the day, so I swear by this stuff. I have both in soft brown. If I'm having a "no makeup" makeup day, I just throw on concealer, mascara, and the gel because it fills them out a bit but not too perfectly and just makes me feel more polished. 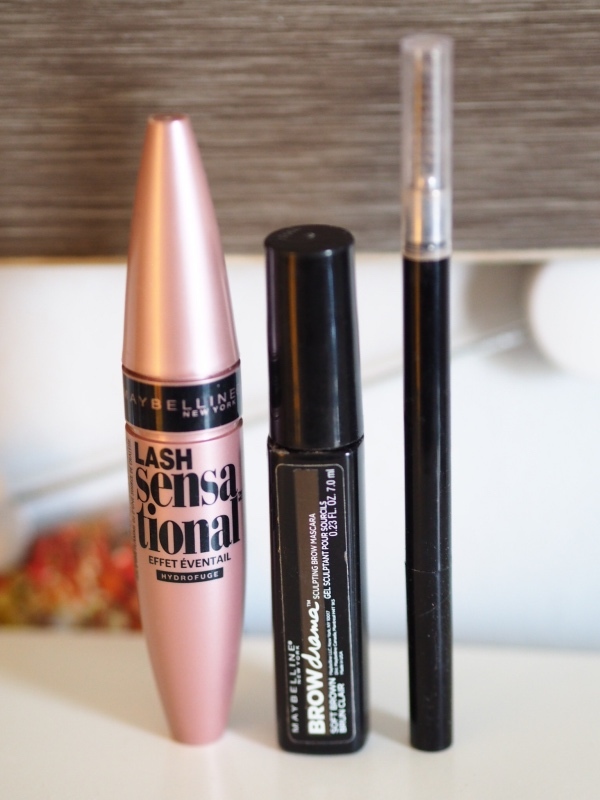 I truly believe that eyebrows are the best way to frame your face and give it shape, so if you're looking to try out new things without spending tons of money or buying anything too complicated, these are for you! I am not usually one for bright lipstick or sticky gloss, so I used to either throw on chapstick throughout the day or just skip lip color all together. 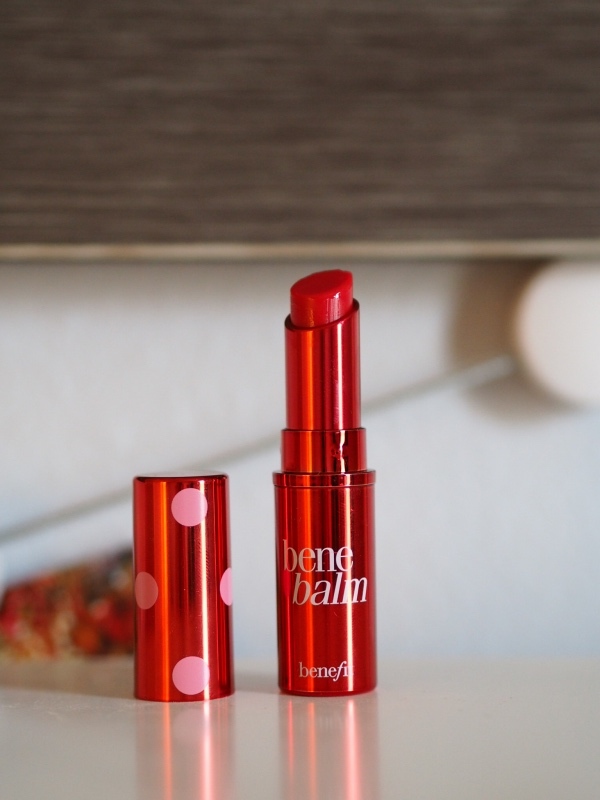 That is all changing lately though as I'm trying out LipSense (more to come on that later) and I purchased this new lip balm, aptly named Bene-Balm. It's by Benefit, and they also make a liquid lip tint version in this same color. I originally tried the tint which I received as a sample, but when I saw this in store I had to pick it up. It's that perfect rosy color that's not too pink or too red, and it feels just like chapstick on your lips. I don't even use a mirror to apply it anymore because it's sheer enough to not look crazy if I overdo it a bit. I love the ease of it and I really like being able to add a bit of color without having to worry about it wearing off or getting on my teeth. I hope y'all enjoyed a peek into my makeup bag - please let me know if you have any recommendations for other products I should try out! I love reading your comments! Have a great weekend!